Greetings again from the darkness. No one has sung the words “I’m a MAN” better than the great Muddy Waters, but even he would have been unable to bounce back from the ramifications of the split-second reaction of Tomas when things go awry at a mountainside family lunch. Writer/director Ruben Ostland delivers an intriguing and thought-provoking look at gender roles and the definition and expectations of masculinity, especially within a family. What makes a real man? What is a hero? Is our predilection of survivalist or protector hard-wired into our DNA? And what happens to a relationship when the foundation of respect crumbles? Would you believe this film tackles these emotional issues, and does so in such a brilliant manner, that we often find ourselves chuckling (albeit with a tinge of guilt)? 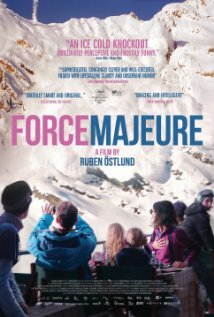 A family vacation in the French Alps takes a turn when, while lunching on a veranda overlooking the ski slopes, a controlled avalanche goes wrong and the café is threatened. Tomas (Johannes Bah Kuhnke) grabs his phone and goes scurrying for protection, while his wife Ebba (Lisa Loven Kongsli) covers the kids and calls for his help. Both are instinctive reactions, and while one recalls George in a “Seinfeld” episode, the other is more in line with what we expect from a parent. Although the avalanche turns out harmless and the family members are physically fine, the emotional shockwaves of Tomas’ actions reverberate through the family … and even through another couple (Kristofer Hivju, Fanni Metelius). There is a exceptional dinner party scene with the two couples which brings the issue to a head, and it’s excruciatingly painful and funny to witness. This is terrific story telling and filmmaking and acting. The film is Sweden’s submission for Best Foreign Language Oscar, and it must be considered a favorite so far. Though I’m not a huge fan of the final 10-15 minutes, that doesn’t take away from the questions as the characters try to come to grips with the situation. The filmmakers provide some really nice contrasts between dark humor, disappointment and broken trust. I challenge you to find scenes of toothbrushing that generate more tension and relationship insight.